A large impressive native tree with a thick trunk and corky branches. Foliage is dark green above and grayish beneath. Fall foliage is yellowish-brown to purplish. 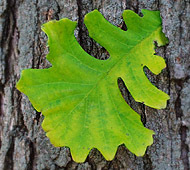 This oak has large sharp-toothed leaves with fall colors of yellow/orange/brown with a white cast to the underside. Short, stout trunk with wide spreading branches. Mature height of 50' to 60' but may grow up to 80'. 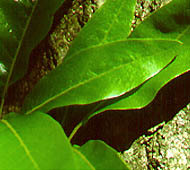 Short-stalked leaves have 3-7 pairs of rounded lobes, dark green above and pale green beneath. Fall foliage is yellowish-brown. An upright growing hybrid that produces sweet acorns and retains its leaves late into the winter. Very drought tolerant. Fastest grower of the oak trees. 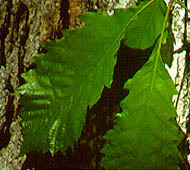 This oak is a large, hardy tree with glossy, green leaves that turn deep red in the fall. This oak has a distinctive upright oval shape. Beautiful all season long, fall foliage is yellowish brown. 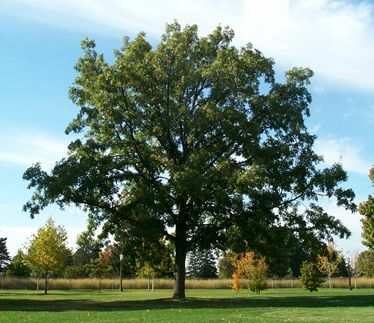 As a fast growing tree in its youth, it makes an attractive shade tree with dark green foliage in the summer turning yellow to golden brown in the fall. Adaptable to all soil types except alkaline. Fast growing and tolerates a wide range of soils. Leaves are glossy dark green on top and pale green on the bottom, scarlet in fall. The only oak tree with smooth, no teeth leaves. Foliage is dark green with yellowish to rusty-red fall colors. Grows well in bottomlands but adapts to many habitats. 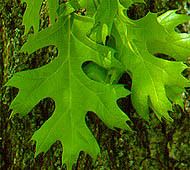 The largest growing of the oaks. Dark green leaves on top, pale green on the bottom. Fall color ranges from russet to orange-red in good years, although many trees have subdued fall color with hues of red and yellow on otherwise brown leaves in autumn. Well adapted to wet, poorly drained soils. Dark green foliage with felty white underneath. Fall color is yellow brown to reddish. Has been known to have lived over 600 years. Light gray bark, slightly scaling. Leaves emerge pink in the spring, turning glossy green and then change to red/brown in the fall.